ups: Absolutely unlike any other game; incredible beauty. downs: Shows the shortcomings of the PS2 hardware; perhaps too enigmatic for some gamers. Sony\'s Shadow of the Colossus is the second game from the developers of the critically acclaimed ICO, which dazzled audiences with a completely unique take on next-gen graphics in the early days of PS2. 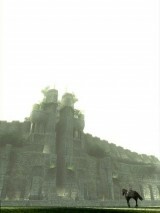 ICO departed in several ways from typical gameplay conventions, and that unique take, combined with the moody graphics and audio, convinced critics and gamers alike that it was a different breed. The same team, led by designer and artist Fumito Ueda and producer Kenji Kaido, has now completed Shadow of the Colossus, and it is an even more determined step away from the norms of the gaming industry. Shadow of the Colossus is not for everyone, but for anyone serious about the art or experience of videogames, it is a title that cannot be overlooked. There is a school of thought that the opening animation for a game is just as important as the final cutscene, perhaps moreso because if one never begins the game, then one will certainly never finish it. In keeping with this school of thought, Shadow of the Colossus delivers from the moment the disc loads. A long, slow movie unfolds before the player, showing the slow progression of a figure riding a horse through breathtakingly huge landscapes. The camera angles are flowing and epic, framing a very small protagonist amidst a very large environment, creating the first feelings of facing something much larger than yourself, overwhelming adversity. The game picks up at the end of this journey, where the protagonist approaches a giant temple and rides his horse into the main room, again with near-excrutiatingly slow progress. There is no rush to the movement, and the player becomes aware that the protagonist carries a body draped across the saddle. He places the body on an alter and is confronted by some dark ghost-like creatures. He holds up his sword to ward off the smoky imps, and is not surprised when the light reflected from the sword vaporizes them. A voice speaks from above. In a conversation spoken in no known language, the protagonist asks the voice to resurrect his love, that she died before she should have. The god-like voice tells him that it will restore her life if the protagonist can defeat the 16 monsters, colossi, represented by 16 statues in the temple. Thus begins the game. Over the next 16 hours or so, you guide the protagonist through 16 of what are essentially the most amazing boss battles ever devised. Setting out on our horse, Agro, and using the light of your magic sword as a compass, you must seek out the first of your foes. It is a shock, even after seeing advertising and previews of the game, to encounter that first colossus. It is gigantic, hundreds of feet tall in the game world, lumbering along and seemingly invulnerable. After some trial and error, you figure out to jump onto the monster\'s furry spots and hold on for dear life. Eventually, you can climb to the special spots where the colossus is vulnerable to attack. Climbing, jumping and crawling on a living beast is incredibly difficult at first, but quickly becomes a real joy. In past games, a \"platform\" would move in small, predictable ways, and the most action seen in level movement came in the form of a rocking motion to indicate a boat at sea, or something like that. Even in fights on top of train cars, the movement is primarily a graphical affect that doesn\'t change much of the gameplay. However, in Shadow of the Colossus, the colossi make up living game levels of their own. Your climbing, grabbing, swinging and jumping skills all come into play on the back of a gargantuan colossus, and each Colossus is different, requiring different approaches. After the first few battles, where you get used to climbing on the colossus to attack it, the environment plays a more important role. Some of the colossi are vaguely anthropomorphic, but others are insane flying monsters or bizarre water creatures. In these battles, motion becomes a huge factor as you either fight wind or water, and in some cases Agro becomes an essential tool in defeating the monsters. In later levels, you must exploit the behavior of the colossus in conjunction with the environment, the results of which are often cataclysmic and intense. Shadow of the Colossus is composed like a symphony with judiciously designed movements. Overall, the intensity of each colossus battle increases until the climactic final battle and earth-shattering final cinemas. But each colossus itself provides increasingly clever and intense gameplay. After each battle, the protagonist is teleported back to the temple and the process begins again: ride, fight, repeat. This gameplay aesthetic is difficult for some gamers to get used to. The rides to reach each colossus increase in length throughout the game, reaching a real five or seven minutes near the end. Of course, if one gets too much off-course (and there are a couple tricky locations to find), these rides can easily balloon into 20 minute exercises, which is fine when you\'re just admiring the scenery, but not so good when you are genuinely lost. There are no people to talk to, no villages to visit, no accessories to buy. Occasionally you find a lizard, which you can shoot with your bow and eat to increase your strength. These turns away from typical gaming conventions are partly responsible for making Shadow of the Colossus such a unique and holistic experience. The world is obviously crafted with care, and each element of it has a unique feel, as if it has evolved that way. There are no unnecessary gaming conventions injected to clutter the task at hand: You are trying to revive a loved one, and that is all that matters. This is not a world in which you want to spend years of your life; this is a task that must be completed. Small details such as the interaction of the protagonist and his horse, Agro, are wonderfully handled. Agro does not drive like a horse-shaped car, which greatly enhances his appeal as a character. The player interacts with Agro by prodding him on or whistling for him. Let Agro go on his own and he\'ll navigate tricky passages for you, and he\'ll make the occasional wrong turn. In the course of the game, the relationship the gamer has with Agro grows and takes on a very unique quality. There are also more moves in the game than those documented. For example, holding R1 and different directions on the left analog stick perform moves such as riding side-saddle and standing up on Agro\'s back. These and other small elements are little gems of discovery waiting to be mined out by the player. Upon finding a new ability, it really feels as though you are engaging with another world in which you have different skills. The visuals are completely amazing in spite of the shortcomings of the PS2 hardware. The aliasing and fry on textures is terrible, but in spite of that, the environment feels complete with amazing vistas and excellent atmospheric effects. The motion blur that occurs while panning the camera adds to the realism of the experience and helps make it feel like you are shooting a movie as you pan around your galloping steed. Also impressive is the sense of scale in the game. Everything is huge: The landscape is huge, the temple is huge, the colossi are colossal, the game takes a long time to get where it wants to go. While some gamers will complain that Shadow of the Colossus is \"slow,\" it\'s obvious that \"slow\" and \"big\" are two aesthetics that Ueda and his team of developers fully understand. And, of course, the collateral effect is that the protagonist and the player feel exceptionally small, which is a nice turn from the over-buffed heroes of so many games. It also lends to the feeling of great terror and great beauty that permeates the game: the colossi are incredible creatures, and the narrative embodies this ambivalence. The overall narrative of the game is one of the most incredible and unique I\'ve seen in ages, but for much of the game it will seem almost nonexistent. 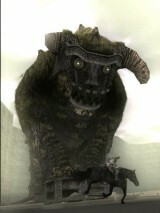 In many ways, Shadow of the Colossus demands that the gamer come to it ? it does not offer up much to beg for your play. It\'s this quality that makes it feel like such an artful game: One must work at it to enjoy it, and the payoff from working at it is excellent. Reviews are limited in what they may divulge of the story and content of the game, so I will have to simply state that the plot of Shadow of the Colossus will be discussed for years to come, and will rightfully take a place among the greatest game plots. In so many ways, Shadow of the Colossus is the kind of game I desperately hope for whenever I slot a new disc into my console: Something to disrupt the stream of very similar gaming experiences and remind me why I play in a visceral way. For many gamers, Shadow of the Colossus will be as enjoyable as a great foreign film: Too much reading for too little stuff-blowing-up. For gamers who love great foreign films, though, or who believe that a game can be a great work of art and provide a stirring emotional experience, then you need to play this one. Shadow of the Colossus is one of the greatest games ever made.